... but none of them ever ask why? That arrow trap, who reloads it? The pitfall trap, who cleans out the bodies and sharpens the spikes? What if the grates get clogged, where will the blood and gore drain? When you are trying to study ancient lore or plan on conquering a kingdom, you don't want to worry about all that. You just want peace. 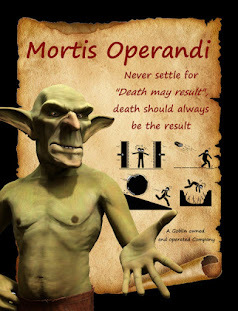 Mortis Operandi is a different kind of company. One that celebrates diversity. One that celebrates value in individuals. With flexible pay and plenty of advancement opportunities, it is a company that knows its workers are it's most valuable asset. As they design, build, and install traps, rooms, obstacles, and repair they are a one stop shop.